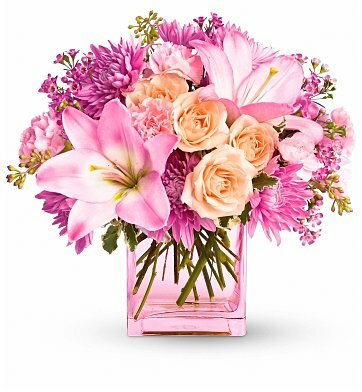 A chic cube vase holds a mix of flowers like roses, lilies and chrysanthemums, all in the softest pink hues. Light up the home or office with this delightful bouquet, perfect for any special occasion. Pink Waxflower, Lush Greenery and more. Standard Arrangement Measures 13" x 11". Pink Charm Bouquet is a hand delivered gift. These gifts are delivered by one of our local design centers located throughout the United States and Canada. Same day delivery is available for most gifts when ordered before the cutoff time. The cutoff time for Pink Charm Bouquet is 10 AM in the recipient's time zone. Beautiful arrangement and fast delivery! I sent these to my daughter for her birthday and she absolutely loved them. I placed the order late in the morning and was afraid they wouldn't reach her ON her special day but they did! I will definitely order from here again. Thank you so much. The flowers and the vase were fantastic, the arrangement gives light to any room. It was simple beautiful, the price was modest compared to the elegance of the arrangement. The person I spoke with when I order the flowers was very sweet, respectful, and have good interpersonal skills. The service was quick, and was even earlier that what I thought. Better than expected and great price! Sent for Mothers Day. The flowers were beautiful, better than expected and the price was really great. I compared to other online places and lets just say I will come to this website for all my flower needs. Customer service was awesome too. Thanks! Everything that we expected, great job! Nice arrangement containing the flowers in season in the picture. Substitutes were beautiful, too. WOW!!! They were beautiful flowers, it certainly made my daughters day at college, thank you. The flowers were fresh and new. It was loved by the receiver. She loved them and so did her parents. Thank you! Flowers were absolutely fabulous. Receiver was delighted. Presentation was amazing and great had vase included. Would definitely order them again! Very much satisfied with your service, guys. Thank you! I ordered these flowers as a sympathy gift for my step mother and the loss of her mother. I was called the next day and told about how beautiful the boquet was! It turned out to be the perfect gift and the pricing was great! Thank you for putting together this beautiful boquet and delivering them on time! I will definitely use you again in the future! Just in time! They were beautiful. They were beautiful. Your flowers truly lifted my daughter's spirits and the delivery was perfect. My cousin was thrilled. Always happy with this company. My mother-in-law received this arrangement for mother's day and loved it! She said they smelled great and were beautiful. Very nice arrangement. Delivered on date/time requested. Very pleased with your company. I wanted roses for my sister Rose's 70th birthday and she called thrilled and overjoyed with her present! She said the unusual pink vase with the lavender hues was the most unusual vase she'd ever seen and the lavender and pink flowers were breathtaking. Great job your florist did for me and I am most grateful! Made a beautiful birthday gift. I sent these as a birthday gift for the same day. My mother in law was thrilled and described the gift in detail. She said each color complimented the other very nicely. She said hers had a green vase instead of the pink but that it was beautiful. Another great gift. Went to my friends house to see the flowers and I was very, very happy. They were exactly as they were in the picture. Thank you so much Gift Tree! I sent this arrangement to a very dear friend for a "significant" birthday. She loved it calling it elegant. She was so happy with the flowers. Sending a special floral arrangement to a special friend made both of us very happy. Although I did not see it, my happiness came from her joy in receiving it. I am not very good about remembering her birthday, but when I did it was truly appreciated because of the beautiful flowers. look like the picture you have displayed. Ordered and received the same day, awesome! Flowers were described by the receiver as the types and colors pictured. Have had very good experience with gift tree delivering what was ordered. Hard to give 5 stars without actually seeing the arrangement, completely satisfied and would recommend! Gifts for Mother's Day. Absolutely beautiful. Very pleased. I sent this as a birthday gift to a friend and when she called she was thrilled the flowers were beautiful and it made her very happy. I would recommend this beautiful bouquet for any occasion! This arrangement is so beautiful. My friend loved it and sent me a picture, and it looked just like on the site. I highly recommend it! I sent this arrangement to my mother for her birthday. She said that the flowers were beautiful and fresh and she loved the vase that came with them. Flowers were delivered when promised-the day after valentines. I have had some bad experiences with ordering flowers right after valentines day-sometimes they send some old flowers that were left over or do not have the type of arrangement I ordered. So I was very pleased with what my mother told me as this is my first time ordering from gifttree. I recently found this site while searching the web to get my son some balloons and cookies for his birthday. I ordered them at 12:15 a.m. and I sent them to where he worked and needed them there by 4:00 p.m. I didn't pay the additional charge to get them there early but they arrived by 1:00 p.m. I was so pleased by the excellent service I am ordering flowers for my daughters birthday! !I ordered some chocolate covered strawberries from a website for my daughters birthday last year with a weeks notice and they delivered them a day late! !Thanks Gift Tree for wonderful service! There were some problems with completing the delivery to a dorm but the result was great and my daughter really liked it. This company stands behind their customers and give Great customer service!....The flowers arrived wilted and did not last the following day. Plant was returned and another was Immediately delivered back in Excellent Condition. The company was apologetic and replaced half of the purchase that was payed out. Very respectful customer service. I highly recommend this company and their gifts!